What will you be able to do as a certified PADI Divemaster? • Conduct the PADI Reactivate program. • Earn the PADI Digital Underwater Photographer Specialty Instructor rating to be able to teach the PADI Digital Underwater Photographer specialty. • Independently guide Open Water Diver course students on the tour portion of Open Water Diver course Training Dives 2, 3 and 4 at a ratio of two student divers per certified Divemaster. • Surface swims to and from the entry/exit point and during navigational exercises. 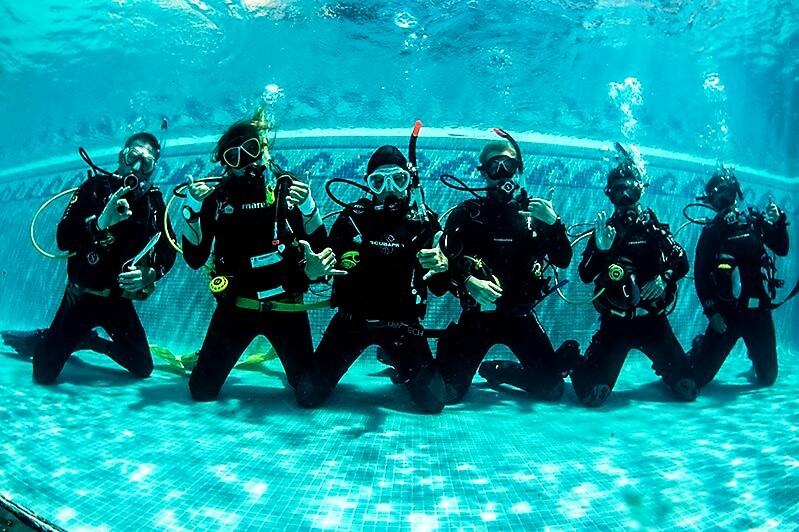 • When the instructor conducts a skill, such as an ascent or descent, a PADI Divemaster can remain with other student divers (with an individual student or buddy team). • Accompany student divers during Adventure Dives or Specialty training dives under the indirect supervision of a PADI Instructor. • Conduct subsequent dives under an instructor’s indirect supervision for Discover Scuba Diving participants after participants have satisfactorily completed the first dive with a PADI Instructor. • Teach Emergency First Response courses after successfully completing an Emergency First Response Instructor course. • Change peoples’ lives forever. • Make new friends throughout the world.